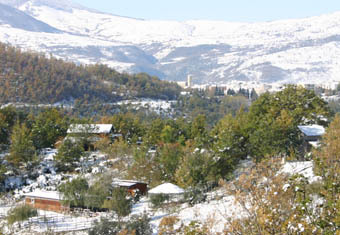 Santo Stefano dei Cavalli is a rural village positioned on a panoramic hillock 3 Km from Agnone at 840m a.s.l., in the green heart of the unspoilt High Molise: it resembles a terrazzo overlooking the snowy peaks of Capracotta, the pleasant valley of the Verrino River and the rocky Pietrabbondante, where the untamed Samnites fortified their dwellings. It is an estate of about 15.00 sq.m.. dedicated to the breeding of the Appaloosa horses. guests, a swimming-pool, a stable hosting twelve horses, a saddlery and a vast aviary for one of most beautiful species of parrots, unique to Molise Region. Santo Stefano dei Cavalli, with its outstanding beauty, is an ideal place to spend a peaceful and serene holiday. The Molise still a little known and small Region being far from the grand tourism circuits can offer a pleasurable wholesome holiday where the holidaymaker will be made to feel most welcome. For those who are seeking a less sedentary stay, High Molise offers interesting guided visits to the famous Marinelli Foundry and its International Bells Museum, to the archaeological sites of Pietrabbondante (at 20 Km. away), walks in the nearby woods of Montecastelbarone and the Natural Reserve of Montedimezzo, splendid skiing on the alpine ski-slops and cross-country circuits of Capracotta (20 Km.away) and Roccaraso (42 Km). High Molise can give satisfaction to visitors in their search for serenity, which nowadays is so rare to find anywhere.